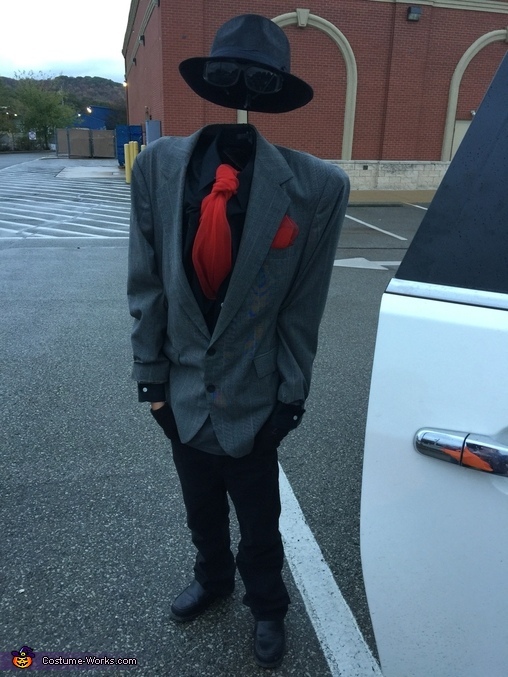 My son Dawson has always loved to come up with unique ideas for his Halloween costume. We really enjoy making it together each year. This year he came up with the idea that he wanted to be the invisible man. This costume was made with no sewing required and for under $10. We made a trip to The local thrift store, bought a suit, dress shirt, and a woman’s sheer scarf which we used for the tie. We took an old cardboard box and cut it down until there was only about an inch the whole way around. This gave the illusion of shoulders in the suit jacket. We then glued a beanie inside the cardboard just below the shoulders, this helped the stabilize the costume up top. Then we hot glued a wire hanger to the back of the car board then we glued a hat that we purchased at Walmart for five bucks. This gave the illusion of an invisible man coming out of the top of the suit. We also glued a pair of dollar store sunglasses to the hat. Next we cut a hole in the seam of the suit jacket and then a hole in the sleeve of the jacket. This way hey was able to slide his arms through. That’s it, it was finished. His costume was a hit. Several people stopped to get their picture taken with him. This costume definitely got a lot of laughs! !Needless to say he had a fantastic time. IN-CREDIBLE! I absolutely LOVE this idea and how brilliant and original it is.